This is one of my favorite side dishes of the season. I love how sweet, salty, and earthy these parsnips are when glazed with a lovely honey and cardamom simple syrup. The syrup itself makes enough to add to cocktails, drizzle over roasted fruit, or simply added to your morning cup of tea or coffee. It’s divine and I cannot wait to play around with more ways to use it. We served the parsnips alongside pan seared top sirloin steaks. The combination of red meat with the sweet/savory side dish was a match made in heaven. The leftover parsnips were stirred into a piping hot bowl of oatmeal this morning and drizzled with a touch more of the leftover simple syrup. This recipe is honestly one of my favorites so far this winter and I hope you all give it a whirl. You can find parsnips at most winter farmers markets this time of the year. They are sweeter than ever because most of them will have endured a frost. However, if you can’t find them at the farmers market your local grocery store should have a supply as well. Cheers to yummy side dishes that make a regular old weeknight meal something extra special. In a small saucepan, muddle the cardamom pods with the back of a spoon. Turn the heat to medium and toast the cardamom pods for about 2 minutes, shaking the pan often. Add the honey and water. Bring just to a boil, then lower the heat and simmer for 15 minutes, stirring frequently (don't let the honey burn). After 15 minutes of simmering and stirring, remove from the heat and let the mixture cool to room tempearuot for 1 hour. Strain through a fine mesh strainer into a jar. Refrigerate for up to 1 month. Preheat the over to 400F. Slice the parsnips in half lengthwise. For larger parsnips, you may need to quarter them. You want roughly 1/4 inch thick pieces. 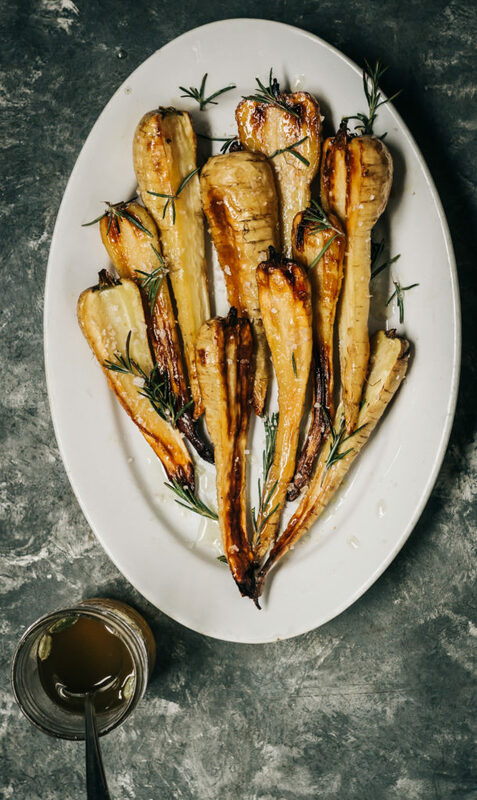 Toss the parsnips with the oil, syrup, and rosemary. Spread on a roasting pan and roast until golden brown and tender. About 30-35 minutes. Toss them halfway through cooking. Sprinkle them with a few hefty pinches of flaky seas salt before serving. Double up on the cardamom goodness- Serve a big dollop of Cardamom Hills Trading Company’s Apricot Cardamom Chutney alongside- one of their line up of small batch fruit chutneys, made with love locally. That honey cardamom simple syrup is brilliant! I always have a difficult time crushing the pods fine enough for recipes. This takes all the work out of it! I’ve enjoyed many of your other simple syrup recipes as well.